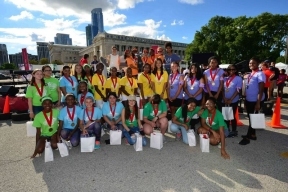 On Saturday, August 13, six teams of teenage women from across the Chicago area competed in the official ComEd Icebox Derby Race Day, the final event of a STEM (science, technology, engineering and math) education program spearheaded by local electric utility, ComEd. 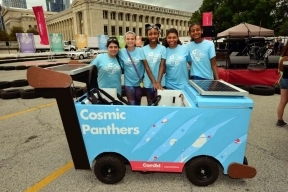 Teams raced solar-powered cars they built from recycled refrigerators around a pop-up track at The Field Museum of Natural History. Celebrity host Yara Shahidi joined ComEd CEO Anne Pramaggiore on-site to provide a play-by-play as the race action unfolds. Teams competed in two race heats with STEM-themed challenges between laps. There were four challenges in total; each one is hands-on and espouses a different aspect of the girls’ STEM knowledge. The race tested not only the girls’ speed and craftsmanship, but also their analytical skills and ability to work together to achieve a common goal. 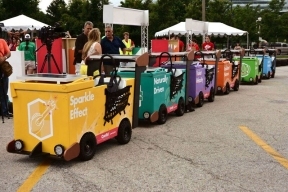 To relive all the ComEd Icebox Derby action to date, or for more information on this year’s participants, program or official Race Day, please visit www.theiceboxderby.com.